Wings USA, Inc., a flight services company based in Janesville, Wisconsin, contracted with TLG Aerospace, LLC to analyze a proposed modification to light aircraft. The twin-engine aircraft is to be modified to include a large circular cutout in the floor adjacent to the aircraft door. TLG was asked to analyze the aircraft before and after the modification to determine whether or not the modification would have a significant impact on the fuselage stiffness. TLG engineers generated the pre- and post-modification geometry in CATIA V5. 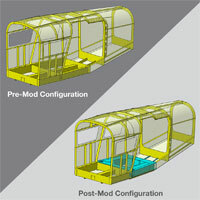 To accommodate the cutout, a section of the longitudinal beam at the center of the floor of the fuselage was removed in addition to a section of skin at the lower outer mold line (OML).